Purser (1848-1943) was a painter in oils and pastels, designer, art activist and patron. Born in Dún Laoghaire, she was educated at a Swiss finishing school and trained at the Royal Dublin Society Art School and in Paris. 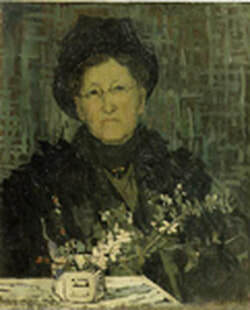 She exhibited, 1872-1930, in Dublin, Belfast, Cork, London, Liverpool, Paris, Brussels, and Boston, showing genre, landscape, flowers, portraits and stained glass. Purser was immediately successful with her brisk technique and Parisian mode and developed a lucrative portrait practice. In 1899 she helped organise the first exhibition of foreign modern art in Ireland. She organised a Nathaniel Hone and J.B. Yeats exhibition in 1901, founded An Túr Gloine in 1903, was a governor of the National Gallery of Ireland from 1911 and was instrumental in the founding of the Friends of the National Collections of Ireland in 1924. Hill (1916-2000) was a painter. Born in Southampton, he was educated at Marlborough college, Wiltshire. He became interested in painting and drawing and in 1933 studied stage design at Munich. He visited Vienna, Russia, China, and Japan and lived and painted on Bernard Berenson’s Italian estate, I Tatti. He became a celebrated portrait painter of royalty and also promoted James Dixon, first of the Tory Island painters. In 1981 he gave his Co. Donegal home, St. Columb’s (now Glebe House and Gallery), and its contents to the state; in 1999 he was made an Honorary Irish Citizen. O’Brien (1865-1945) was a portrait and landscape painter. Born at Foynes, Co. Limerick, he studied painting in Paris, Antwerp, and London. Returning to Dublin in 1901, he became a prominent figure, serving as president of the Royal Hibernian Academy, 1910-45, the Irish Agricultural Wholesale Society, and vice president of the Royal Irish Academy of Music. He was an academic painter, but his style loosened when he was painting familiar scenes, such as the Shannon, the Liffey, and Dublin Bay. Until 1920 he lived periodically at his family home at Cahirmoyle, Co. Limerick and his depictions of farming and family life there are among his most sensitive works. Russell, George William, widely known as ‘AE’ (1867-1935) was a poet, mystic, editor, writer and artist. Born in Lurgan, Co. Armagh, he was trained at the Metropolitan School of Art. He worked as banks organiser for the Irish Agricultural Organisation Society before becoming editor of the Irish Homestead, 1905-23. He was a leading figure in the Dublin Theosophical Society from 1888/9 until 1908, when he formed his own Hermetic Society. He became vice-president of the Irish National Theatre Society in 1902, a position he still held when, in 1904, this became the Abbey Theatre Company. He declined an invitation to become a senator of the Irish Free State but accepted the editorship of the Irish Statesman (1923-30) where he promoted young Irish writers. Shaw (1856-1950) was a writer. Born in Dublin. He did not attend university but started work at sixteen as a clerk in a land agent’s office. He left Ireland for London in 1876 and was to live in England for the rest of his life. Some dozen of his fifty-two plays continue to hold the stage, and the larger-than-life persona of Shaw manages to reach a wide readership through the characteristic wit and iconoclastic energy of everything he wrote.